The original discovery of opal in Virgin Valley was around 1905. At first, little was known about the pretty stones found by someone who was most likely herding sheep. They probably found opals that had eroded from the soil. After the stones were identified as opal, the rush was on. Opal prospecting and mining began in earnest around 1907. Rainbow Ridge Opal Mine has been in production for over one hundred years. It has been owned and operated by the Hodson family since 1949. The Roebling opal, one of the more famous opals from Virgin Valley, was mined at Rainbow Ridge in about 1918, and is in the collection of the Smithsonian Institution in Washington, DC. Some sixteen million years ago, the area known as Virgin Valley today, exploded with volcanic activity. The volcanic swelling of the terrain eventually subsided, collapsed, flooded, and became a lake. Sediments were washed into the lakebed, eventually altering to Bentonite clay. Forests grew, and were destroyed by subsequent volcanic activity. Pieces of the destroyed trees, mostly conifers, were washed into the lake, where they became water laden and sank into the muddy lake bottom. Buried by subsequent layers of volcanic materials, the wood lay trapped in the clay. Over time, the lake drained and the woody debris began to rot away, leaving molds of the limbs, twigs, and pinecones that had been trapped in the lake bed. The layers associated with the volcanic activity are rich in water soluble silica. Water, moving through the volcanic layers, dissolved silica, and carried it into the voids created by the decayed wood. Silica-gel filled the available spaces, and created either complete or incomplete casts of the woody material. Some of the wood was still present, allowing only partial opalization, which we see as a wood and opal combination today. The majority of pinecones do not decay completely, and are usually still woody. Occasionally we find a pinecone that has been completely replaced by opal, usually with no play of color. On very rare occasions a pinecone is found that has been completely replaced with opal, and has beautiful play of color. These “fire cones” are an amazing and important find. When the conditions are right, spheres of silica will stack in an orderly arrangement which will allow light to be diffracted into its spectral colors. We see this phenomenon as play of color or “fire” in opal. Water droplets do the same thing with light when we see a rainbow. If the spheroids of silica are not consistent in size or shape, they will not stack correctly, and we see no play of color. This non-phenomenal opal is called common opal or potch. Opals from Virgin Valley are primarily "specimen only"; they are very unstable. Because of this instability, these opals are not often cut and used in jewelry. The reason for this is two-fold. First, this is a very young opal; being only around 15 million years old. Secondly, this opal has formed in Bentonite clay. Bentonite clays are very effective at sealing moisture in and do not drain quickly. Because of this, our opals have a higher water content than most other opal producing areas in the world, The opals have not had enough time to dry slowly, which would allow them to gain strength or stability. When a Virgin Valley opal is taken from the wet clay and allowed to dry out it will crack and craze, usually! It is not always the case, but it happens so often, and sometimes so badly, that we recommend not allowing them to dry. What this means is that most of the opal ends up being “wet specimens” and are kept in water. That being said, the colors produced by a Nevada opal are world class. They make a fine display piece as a wet specimen, and are sought after by collectors because of their colors and wood origin. As was stated before, not all of this opal will craze. Sometimes a piece is missed in the initial mining process, ends up in tailings and dries out. These pieces will usually craze to some extent, but occasionally one is found with little or no crazing. A piece such as this can sometimes be cut for jewelry. The rule of thumb we use at Rainbow Ridge is this: If an opal has come from wet clay, or “virgin ground” we will keep it wet, clean it up and display it as a wet specimen in a suitable display called a dome. If an opal has come from tailings, and has dried for at least a year, it will become a dry specimen. If a piece that has been dry for at least a year shows little or no cracking, it might have potential to be cut. The opal from Virgin Valley can appear in many different ways, some much more rare and desirable than others. The base or body color is the underlying color of the opal, disregarding the play of color. It can have an almost colorless base, like water, through many different base colors; whites, tans, yellows, greens, browns to black. Any of these opals can have a variety of transparencies, from a piece that is so clear you could almost read through it, called crystal, through semi- transparent jelly to opaque. The play of color varies as well, from one predominant color to multi-colors. The pattern size of play of color can vary from a shimmery pin-point fire to fish scale, and broad flash to harlequin. Many of these terms are descriptors, but you get the idea. An opal that is highly transparent will exhibit fire all the way through it, making it very lively in appearance and usually more valuable. An opal that is opaque may have fire all the way through it, but can only be seen on the surface, making for a “sleepy” appearance that requires intense light to be seen at all. 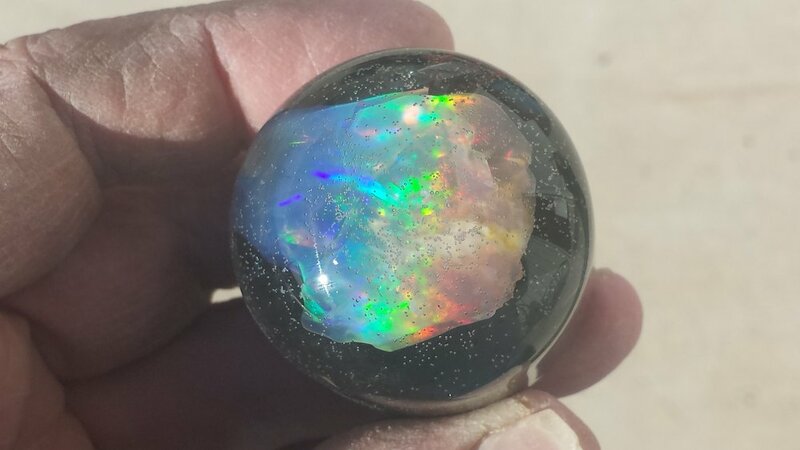 Black opal is the rarest, and most valuable of the base colors. Black will showcase play of color better than other base colors will. Red is usually the most sought after play of color. And a high transparency will make for a lively specimen. A highly transparent opal with a black base color is sometimes described as a “root-beer black” because it will appear black when viewed with reflected light, and a deep brown or root-beer color when viewed with transmitted light. Some opals will show play of color only when they are viewed with transmitted light, or backlit. These opals may or may not exhibit play of color when viewed with reflected light. They are called “contra-luz” opals, which means "against the light". It is a good idea to view an opal with both directions of lighting to check for contra-luz fire.